Laura is a 42-year-old woman who comes to see her primary physician. She is about 40 pounds overweight and has progressively worsening and painful osteoarthritis in her left knee. She has asthma, which keeps her out of work at least one day a month. This is not an unusual presentation to any primary physician’s office. Her physician will look after Laura, prescribing inhaled steroids for her asthma, recommending weight loss through better diet and exercise, and prescribing anti-inflammatories for her painful arthritis until she gets to a point where she needs more or different medications, and later a knee replacement. And there is nothing wrong with treating Laura in this way: it is in fact good care by a responsible clinician. But why is Laura, at 42, overweight, and why has she long had asthma attacks? She is overweight because as a child of a single mother who had to work multiple jobs to keep the family afloat, Laura grew up eating unhealthy but affordable food. This led to her becoming overweight at a young age, making it much harder to take off pounds in adulthood. Her knee arthritis is directly a result of her weight, but compounded by her job working in an office, where she sits all day, with relatively few breaks. And her asthma got worse as a child when, in the lower income neighborhood where she grew up, a bus depot was sited, spewing diesel fumes that inflamed her airways. So, Laura the patient needs treatment today, at 42. But her medical conditions are a product of her past and of the world in which she grew up. Her physician can say to Laura that she should eat better and exercise more to lose weight, but what chance does Laura have if her asthma makes even exercise challenging and the cost of healthy food is prohibitive? We suspect that most readers will recognize that Laura was not well served by life’s lottery. Perhaps some of us were luckier than Laura in our circumstances of birth; others may not have been. Critically though, it is true for all of us that our health today is a product of our past. If we were to choose one thing to do to maximize our health, we would do well to choose to be born to high-income, well-educated parents who live in good neighborhoods. The public’s health is inextricable from our past, our place, our politics, and the powers that shape these factors. We can keep treating Laura, and keep spending more and more money on healthcare, but until we invest in a world that produces, promotes, and supports health, we are always playing catch-up and we can do much better than that. One in five active-duty soldiers have a diagnosed behavioral health disorder. These authors designed the Virtual Hope Box (VHB)—a phone app containing reminders of positive life experiences and people who care, coping resources, and reasons for living—to help a distressed user restore emotional equilibrium. They conducted a randomized trial of the VHB in a sample of patients at risk of self-harm who were being treated with psychological counseling in Department of Veterans Affairs (VA) clinics. VHB recipients had greater increases in the belief that they had the capacity to stop unpleasant emotions than participants not given the VHB. As a supplement to in-person clinical treatment, this smartphone app may benefit military personnel (and perhaps other populations) dealing with suicidal thoughts. Residents of US territories, which include the US Virgin Islands, Guam, American Samoa, Puerto Rico, and the Northern Mariana Islands, sometimes have limited access to health care because of lower federal insurance reimbursement and geographic barriers. Some territories are also entangled in financial crisis. Puerto Rico’s struggle with debt came after 1996, when the island’s government experienced a recession and borrowed funds. Years of unethical loaning by Wall Street made the situation far worse for Puerto Rico, and now, much of their health care is funded by borrowed money. In addition, other territories’ infrastructure sometimes cannot support wide access or efficient and effective medical care. Some areas in Guam, for example, struggle to provide readily available potable water and face frequent power outages. Some hospitals on the US Virgin Islands are old and crumbling and patients who cannot receive the treatment they need are transferred to Puerto Rico and the mainland. Tracy M. Layne and colleagues assessed differences in the timeliness and quality of breast cancer care among female Medicare beneficiaries in the continental United States and its territories. The researchers looked at timeliness of care as an indicator of quality, based on evidence linking delays in treatment with stress, poor survival, and reemergence of cancer. 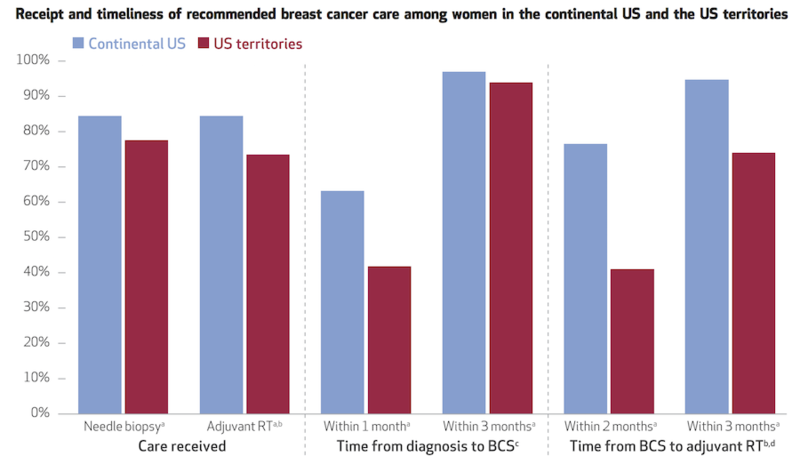 The bar chart above shows that women living in the territories were less likely to be diagnosed with breast cancer by the recommended method of needle biopsy than women in the continental United States. After diagnosis, women in the territories were also less likely to undergo breast-conserving surgery within one month of diagnosis and to receive radiation therapy within two months after surgery. Regardless of how early the treatments are given, women in the territories are less likely to receive the recommended care for breast cancer than women living in continental United States.